This trainer hopes to empower women through her love of fitness. Air Force spouse Christine Finklea went from training military wives in Oahu, Hawaii, to opening her own fitness studio, Kaia F.I.T., in North Dallas. She hopes to build what she calls a “tribe” of empowering Dallas women. Contact Kaia F.I.T. or go here for frequently asked questions. You’re the owner of Kaia F.I.T. Dallas, but you’re also an instructor. Do you teach every day? What’s your favorite aspect of your career? I am the owner as well as head coach, so I do coach every single day. I’m always going to be a coach at Kaia because it’s what I love doing. I wanted to have my own place because I never wanted to work for a gym where part of my job was to push supplements and sell packages. My heart is really about what’s best for the women. I love connecting with them. 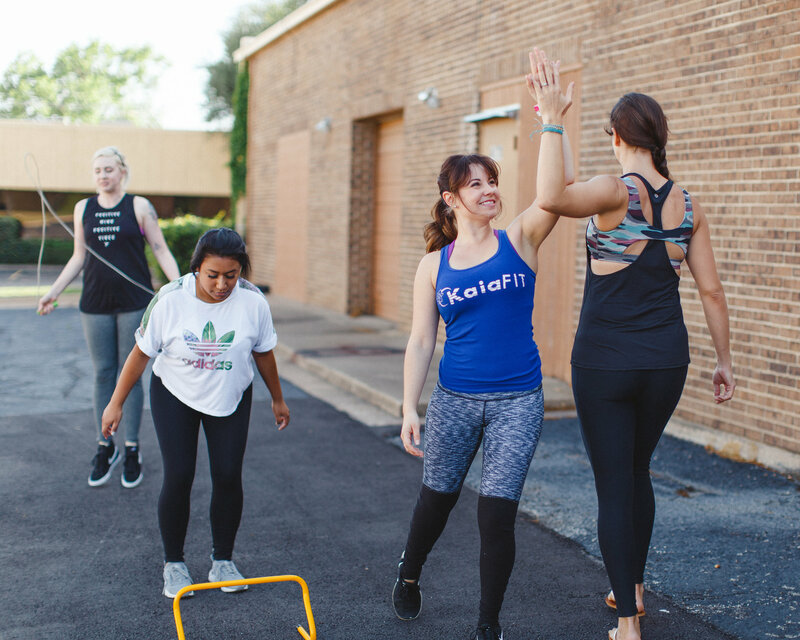 At Kaia, we believe that women need a place where they can empower each other, and we do that with fitness. What kind of workout does Kaia F.I.T. offer? Our signature workout is cross-training, meaning that we pull from a lot of different avenues to incorporate muscle confusion. So every time you come in, there’s a little bit of a difference in the workout. This way, your body never plateaus, and your mind doesn’t get bored. Finkle enjoys connecting with the women she works with through Kaia F.I.T. Dallas doesn’t have any Hawaiian mountains, but what’s your go-to Dallas outdoor activity? I go for walks and runs with my chocolate lab, and I’m hoping to get into paddleboarding as well. I’ve seen lots of pictures of women who are out kayaking and paddleboarding in areas of Dallas, but I’m still so new here that I haven’t done it yet. What’s your favorite healthy restaurant in Dallas? I haven’t eaten at a lot of restaurants yet. A really like this vegan restaurant just up the road from us called The Loving Hut. I really like their food a lot; it’s very plant-based, and I like to support local. Wellness really is a choice, and it’s loving yourself enough to not spend your life in negativity. Pizza! It’s definitely my go-to comfort food. Pizza could be its own food group as far as I’m concerned. Wellness, to me, is an attitude that you choose to live every single day. You choose to stay committed and to come to the gym; you choose what food you put in your body; you choose whether you walk out with a smile or whether you keep a raincloud over your head. So, to me, wellness really is a choice, and it’s loving yourself enough to not spend your life in negativity. Wellness is also surrounding yourself with like-minded people, which is one of the reasons Kaia is so wonderful. I really think one of the keys to wellness is having that support group and that tribe around you to encourage you during the days when you do struggle. Kaia has teamed up with Fitness Military Alliance and Hope for The Warriors. Tell me about that. My husband was in the Air Force, and now he is in the Reserves. We understand the different ways the military can affect people’s lives, and sometimes it’s really hard to reintegrate into civilian life. We’re actually going through that right now, and it’s very difficult. I want Kaia to be a place where veterans and their family members can go if they just need a place to have a support system where they can use exercise, nutrition, and love from other amazing women to get through whatever hardship they’re facing. We want to offer them some free training. People have helped us in our situation so much, and we want to pay that forward by helping other military couples.